Editor’s Note: Today’s article comes from David Fessler, The Oxford Club’s Energy and Infrastructure Strategist and a contributor to Energy & Resources Digest. If you haven’t already, click here to subscribe automatically - it’s free. It’s no secret that a once-in-a-century shift is hitting the transportation sector. 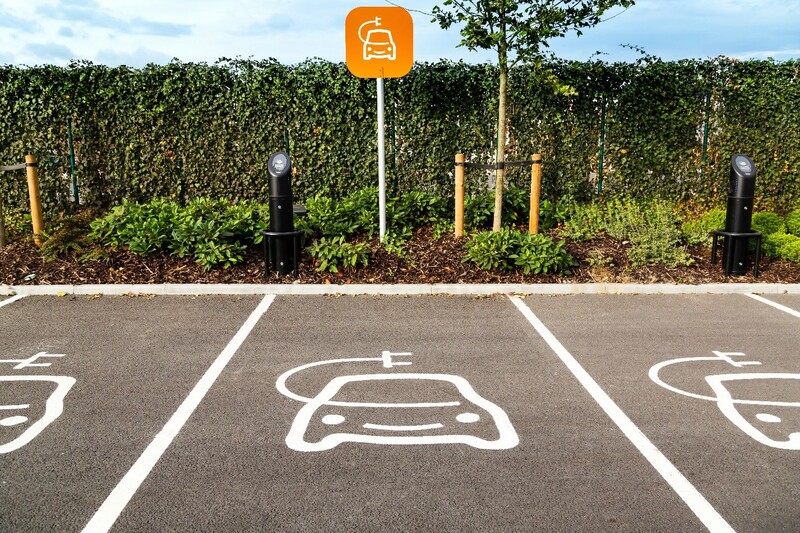 By 2030, annual sales of electric vehicles (EVs) could hit 24 million, according to Bloomberg New Energy Finance. Longtime readers know I’m big on pick-and-shovel plays. These are stocks or funds that allow investors to profit by investing in the raw materials every manufacturer requires. There are a number of new battery technologies in development, but for now, lithium-ion technology is the standard for EV batteries. This will be the case for at least the next five years. 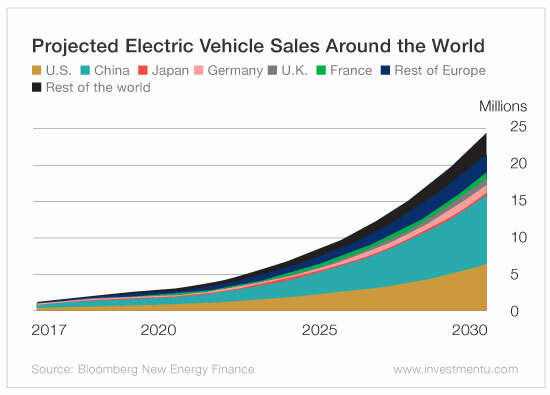 It’s easy to see how the demand for lithium and other EV battery materials is going to explode. Supply gaps will happen as EV manufacturers ramp up battery production. 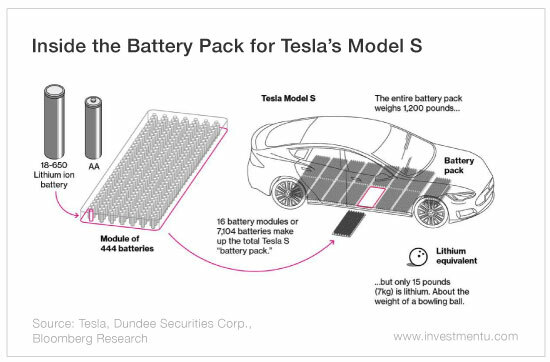 I believe the long-term investment opportunity for battery materials is very compelling. It seems like more manufacturers announce big EV model programs every week. Since 2010, the cost of lithium-ion batteries has fallen 73%. By next year, EVs will be very cost-competitive with internal combustion engine (ICE) vehicles. That will spur even more rapid EV adoption. There are many countries far ahead of the U.S. as far as taking steps to address climate change. Many have set dates beyond which the sale of ICE vehicles will be banned. Norway is banning the sale of EVs after 2025. France announced the end of gas and diesel vehicle sales by 2040. India wants all vehicles on battery power by 2030. That’s an aggressive timeline for the second most populous country in the world. However, even if India doesn’t hit that date, its aggressive measures are sure to make a major impact. Even China announced it is considering a ban on the sale of ICE vehicles. It has yet to specify a date. But rest assured, it will eventually announce a date (probably 2030 or 2035) beyond which it will ban the sale of ICE vehicles. It’s not just countries (and there are many others)... Car manufacturers are moving away from ICE vehicles too. This past July, Volvo announced it would be phasing out ICE vehicles in favor of EVs. Mazda and Toyota just announced a partnership with Denso Corporation to form a company to develop EV technologies. Daimler (Mercedes-Benz) said it’s fast-tracking its EV program. It now expects to have 10 new EV models in its showrooms by 2022. And finally, Volkswagen announced its plans to produce 30 or more EV models by 2025. It expects them to account for 25% of all of the company’s sales. 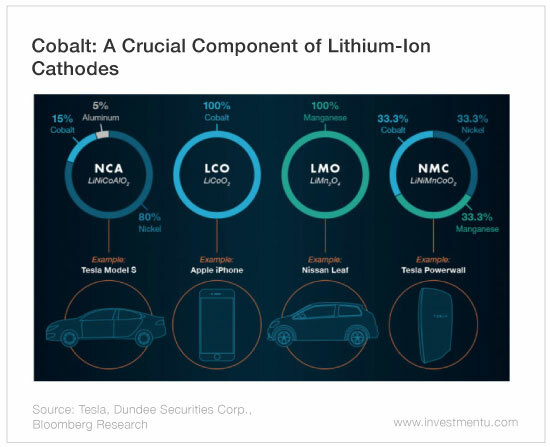 It’s pretty clear the effect all this EV demand is going to have on EV battery materials such as lithium, cobalt and nickel. This presents investors with an opportunity. Investing in lithium-ion battery material suppliers is by far the best way to play this sector. P.S. In my Advanced Energy Strategist research service, I’m always on the lookout for companies that could net my subscribers triple- or quadruple-digit gains. For instance, I have an artificial intelligence stock that is up more than 300% since I recommended it a little more than a year ago! In addition, I have two other triple-baggers in the portfolio. In fact, the average gain of all 18 positions in the portfolio is more than 53%! Some of my newest recommendations are small microcaps that could eventually become quadruple-baggers. They are all riding the big energy and technology wave that has no end in sight. My paid subscribers have access to three new battery material companies I’ve just added to the six we already had in the portfolio. Those six have an average gain of 70.4%. If you want to learn more about my research service, click here for access. You’ll be directed to a special report on how you can get your hands on the names of the three new battery material stocks that I think are going to soar over the next several years. David Fessler’s Advanced Energy Strategist subscribers aren’t new to pick-and-shovel plays on EV batteries. The eCobalt recommendation is one of our lithium battery plays. I recommended the company last October, which means shareholders who got in then could now be sitting on gains of more than 82%. There are plenty more gains ahead for this company. You see, lithium-ion batteries aren’t just made of lithium carbonate. Depending on the battery design, there are dozens of other chemicals that could be involved. One of them is cobalt. A number of the lithium-ion battery chemistries in use today utilize cobalt as part of the battery’s cathode design. The problem is the largest producer of cobalt is the Democratic Republic of the Congo. It’s not exactly a business-friendly place. Even so, the country’s cobalt mines are responsible for about 60% of the world’s production. That equates to about 63,000 metric tons (mt) in 2015 (the latest year with data available). Outside of Salmon, Idaho, eCobalt is putting together a Cobalt Production Facility (CPF) as part of its Idaho Cobalt Project (ICP). The CPF is going to take concentrates from the on-site mine and process them into cobalt, gold and copper end products. The ICP expects to produce 1,500 tons annually of high purity cobalt sulfate for use in lithium-ion batteries. The current mine life is projected to be 12.5 years. The ICP has all of its permits, including an Environmental Impact Statement and a Record of Decision from the U.S. Environmental Protection Agency and National Forest Service. So far, 90% of the earth moving at the mine site is complete. While there has been no announcement yet, I believe that there is an excellent chance that Tesla could end up purchasing all of eCobalt’s production. This is one stock investors absolutely must have in their portfolios.